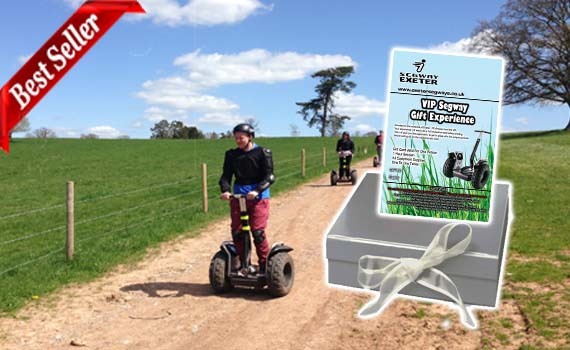 Exeter Segway Experience Vouchers – The Perfect Present! Our Segway Gift Vouchers are very popular! Great for Christmas, Birthdays, Mothers & Fathers Days. We have a few options available. You can purchase an E-Voucher which is instantly downloadable, no waiting for the post! Or you can select for it to be posted. These vouchers can also be customised online, you can and the recipients name and also a message. We also sell printed and gift box vouchers, these are posted 1st class. All vouchers are purchased from our sister site Southwest Experience Vouchers, this is so that you have a secure online checkout when entering your card details. To purchase a voucher just click on the buy button below you will then be forwarded to our secure site where you can customise and pay for your voucher. BE AWARE!! – Our vouchers are not sold on BUY A Gift.com or Groupon, they advertise a Segway Exeter and Segway Devon it is not us it is a company that operates on a mobile basis approx twice a month! As well as Segway vouchers, we also have Quads, Axe Throwing, Archery, Air Rifles, Clay Shooting & More! visit www.southwestexperiencevouchers.co.uk for all options. All of our 1 hour & 75 min Vouchers will include a Free Printed Photo of your experience on the day! Printed Experience Photo Free Of Charge! Our £15 money value vouchers can be used against any package.